That lovable goofiness that the band initially radiated doesn’t exist by accident, though. In fact, ‘Queen Zee and the Sasstones’ in its earliest form was purely a name on a gig poster, there was no intention for anybody to play under that name. Eventually, with five days to go until the show, Zee and Em Dee, a long time collaborator of theirs, decided that they’d bring the band to life and play the show; their set consisted solely of a chaotic cover of The Prodigy’s ‘Firestarter’. They put Scotland indie darlings The Jesus and Mary Chain to shame in terms of both velocity and volume that night, “As a statement against sound engineers we will never turn down”. Their live show has pretty much managed to maintain the intensity ever since. Its urgent, visceral and totally vehement. Guitars and bones get broken with equal lack of concern. Queen Zee’ shows have people excited, liberated, and quite often genuinely terrified. Most, they concede, are “morbidly fascinated”. 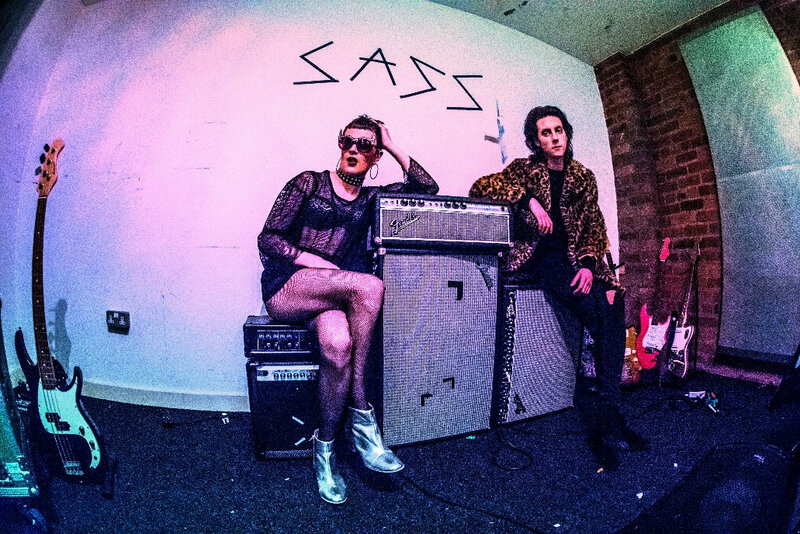 Talking of their band’s approach to playing live, Queen Zee says “I think parts of the queer scene have kind of just become rainbow capitalism, rather than a genuine aggressive force. It doesn't even have to be aggressive, just question it. When we’re on stage, it’s do or die.” You really do get the sense that, at this point, The Sasstones is a huge part of their identity rather than merely a route to it. The band’s duo of self-released tapes (‘Demo Tape 16’ and ‘Hate Male’) are largely centred around their Buzzcocks-like knack of marrying vulgar sonics with earworm melody, creating something inexplicably endearing in the process. Em and Zee split the heavy lifting on the recordings, meaning that the guitars vary from shoegaze-indebted storms to raw, repetitive punk motifs. These songs are overtly queer and overtly personal, but manage to maintain an inviting vagueness. It's very much so the sound of ear-splitting confusion. In terms of future plans, Queen Zee and the Sasstones are all too familiar with formulaic ‘new band’ rollouts, and are happy enough to bide their time. They cite Drop the Dumbulls as the city’s only genuine DIY mainstay, and take aim at venues that present as DIY whilst operating a standard capitalist model of live music, “your venue isn't DIY if you're charging £5 for a pint”. If nothing else, Queen Zee and the Sasstones are an unavoidably loud force for good. Brought to you in association with Cheap Monday. Check out their latest offerings over on their website now.